In leading Mamelodi Sundowns to their first championship since 2007, Pitso Mosimane has become the first black coach to win South Africa's Premiership since its inception in 1996. 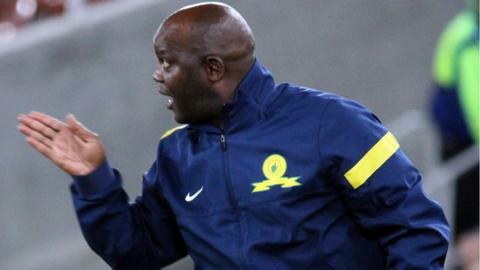 While Mosimane prefers to downplay the issue of race and instead highlight his merits as a coach, it is undeniable that he has struck a big blow for black coaches who have battled to win the confidence of the owners of the country's bigger clubs. "I see it in two ways," the 49-year-old former South Africa international and national team coach told BBC Sport. "For me it's not about being a black coach winning the league, it's about a coach who works hard, a coach who does his job, who understands the local league, a coach who also assesses and respects the game and makes the players work hard. "On the other hand, how many black coaches deserve to coach Orlando Pirates or Kaizer Chiefs or Mamelodi Sundowns? Not many. "It's a fact, we don't want to talk about it but it's a fact. This situation happens where black coaches are never given chances. We are given teams that need to be saved from relegation and all the European coaches and even the local white coaches get the chance before us. "Let's be honest, I came last, I'm not the first. I've got 13 years' experience as a coach but there are I guys that I played with in the Bafana Bafana team, they've been coaches before us. "I work for a team that has an owner, Patrice Motsepe, who is also the president and has a huge profile as a black person and what he has done in business. "He believes a local black coach who grew up in the townships, like him, can also turn around things at Sundowns. The man gave me an opportunity and I'm humbled. Winning the title is the only way to reward people who have vision like Patrice Motsepe." Motsepe, a mining magnate with a fortune estimated by Forbes magazine to be at $2.6 billion, has pumped millions into the club which has enabled them to buy the star players they covet in their attempt to dominate South African football. But over the past seven seasons Mosimane's seven predecessors, including big names like former France coach Henri Michel, Bulgarian legend Hristo Stoichkov and former Dutch midfield maestro Johan Neeskens, all failed to deliver and were ultimately forced out by fan pressure. Mosimane is quick to assert that while black coaches need to be given more opportunities they should also prove themselves. "We need to do the work also. We should not think this is affirmative action and we need to be given a chance as if football owes the black coaches a position. I do the work, my players will tell you I work very hard," he said. "People say it's easy to win with Sundowns (because of their financial strength) but why couldn't they win the league for the last seven years with the players that they bought and with the money that's been put into the team? What's the difference? I work hard, I don't play golf." Steve Komphela, a former Bafana Bafana captain and caretaker coach, has himself developed into one of the league's leading coaches, having taken modest Free State Stars to respectable mid-table finishes and this season turning around a struggling Maritzburg United. He believes Mosimane's achievement can only boost the confidence of aspiring young black coaches. Komphela told BBC Sport: "Pitso's success sends a big message that it is not about the colour of your skin but your character and the brains behind the technical matters. "Maybe this will give the bigger clubs the confidence to grant others an opportunity and those given such an opportunity must grab it." Sundowns and Mosimane have shown what can be achieved when the right man meets the right opportunity.